Andy Farrell, Faldo/Norman. The 1996 Masters: A duel that defined an era. Elliott & Thompson, March, 2014 in the UK, May 1, 2014 in the USA, distributed by Trafalgar Square. $24.95. As the final round of the 2014 Masters is about to get underway, recalling dramatic finishes past raises hope for similar drama this year. Nick Faldo won his first green jacket in 1989, when Scott Hoch famously missed a short par putt on the first hole of a playoff, Faldo having already recorded bogey. Faldo then sank a tournament-winning birdie putt on 11. Greg Norman finished tied for second that year, as he had in 1986, when the Olden Bear made his glorious Sunday charge. Norman had been in a playoff at Augusta, too, but his experience was the opposite of Faldo’s. Larry Mize had holed a pitch on 11 for birdie in 1987 after pushing his approach shot 140 feet to the right. Norman remembered in his memoir, The Way of the Shark, thinking as he approached the green that Mize “was going to have a tough time getting down in two for a par.” What seemed like certain victory had been snatched from Norman’s grasp, just as Hoch’s tortured miscue had provided Faldo with the opportunity for his win. Those consecutive seconds made the Shark hungrier for a victory, and his extraordinary play over the first three rounds in 1996 portended a welcome conquest of Mount Augusta. Then the two best players in the world, Norman and Faldo were opposites in many ways, and Faldo’s good luck at Augusta contrasted wickedly with Norman’s chronic misfortune. 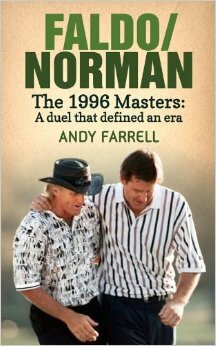 Norman’s collapse in the final round in 1996, the subject of Andy Farrell’s thorough and entertaining account of what he rather grandly calls the “duel that defined an era,” was difficult to watch. Norman’s agony as his lead evaporated, and with it his focus and his swing, summoned pangs of empathy from anyone who has a heart. Norman’s buddy Nick Price reportedly left the clubhouse at Augusta, too distraught to watch any more of the debacle. Norman’s grace in defeat, however, confirmed that he was worthy of our compassion, as he made no excuses and congratulated Faldo with a companionable embrace as they exited the 18th green. A photo of that moment graces the cover of Faldo/Norman. Faldo/Norman is a hole-by-hole account of that fateful Sunday in Augusta, when Norman, at thirteen under, stepped onto the first tee with a six shot lead over Faldo. Norman’s course record 63 in the first round, followed with 69-71, seemed to put him so far ahead that a triumphal final round was inevitable. But as everyone knows, Norman collapsed, while Faldo surged with his second 67 of the tournament. By the time they arrived at the 10th tee, Norman recalled, he “couldn’t hit a good shot to save my life.” Norman staggered home with 78. The eleven-shot swing left Faldo in front after the final putts fell by five shots. Farrell tells a story whose conclusion everyone already knows, but he does so with such bracing detail and accomplished scene-setting that the narrative moves vividly forward. The headings for each chapter, which take their titles from the name of Augusta National’s holes, feature Norman and Faldo’s head-to-head scorecard, so you can see instantly where they started, how Norman’s lead shrinks, and where Faldo put on the pressure. Even though Farrell appears not to have spoken directly to Faldo or Norman, each has written about or been interrogated about that day so often that the secondary sources are ample and comprehensive. Ferrell has mined this material well. Farrell’s narrative also provides an excellent guide to the evolution of Augusta National’s holes, especially those on the front nine, which until recent years were not shown on TV and are thus little known to most viewers of the Masters, especially in contrast to Amen Corner, whose celebrated holes are familiar to every golf fan. By the time Norman doubled 12 against Faldo’s par, it was all over. Faldo had climbed from 7 under to 9 under, while Norman had descended from 13 under to Faldo’s starting place. Norman temporarily righted the ship with birdies at 13 and 15, but another double at 16 meant that the walks up 17 and 18 were as mortifying for Norman as they were triumphal for Faldo. Norman’s recollection of his descent was so gloomy that in his own memoir he reports that he dropped to third place, with Davis Love III moving into second, but that’s not what the official records show. Love finished tied for seventh. Perhaps the 2014 Masters will also produce a legendary finish, but it will be hard to match the agony and elation of 1996, which Andy Farrell has captured so well in Faldo/Norman.